Arizona Oasis Getaway. Amazing Home with All the Amenities! Welcome to sunny Arizona where there is 320+ days of sunshine year round! Relax in quiet luxury while enjoying the invigorating warm and sunny Arizona weather. If you're looking for serenity and relaxation, or perhaps a peaceful day of golf on a PGA-class golf course - this is the place! Have you ever imagined arriving at your destination and being so comfortable that you didn’t want to leave? Have you ever wished for more space to enjoy your vacation with your kids? Have you ever wanted your own pool and privacy to relax and enjoy? Now you can have it all! The San Tan Heights community boasts a huge full-service Walmart Supercenter complete with 24-hour grocery store as well as a Fry’s Food & Drug Store. Other restaurants in the area include a pizza place, BBQ Grill, Starbucks, Olive Garden, Sonic and other fast food options. 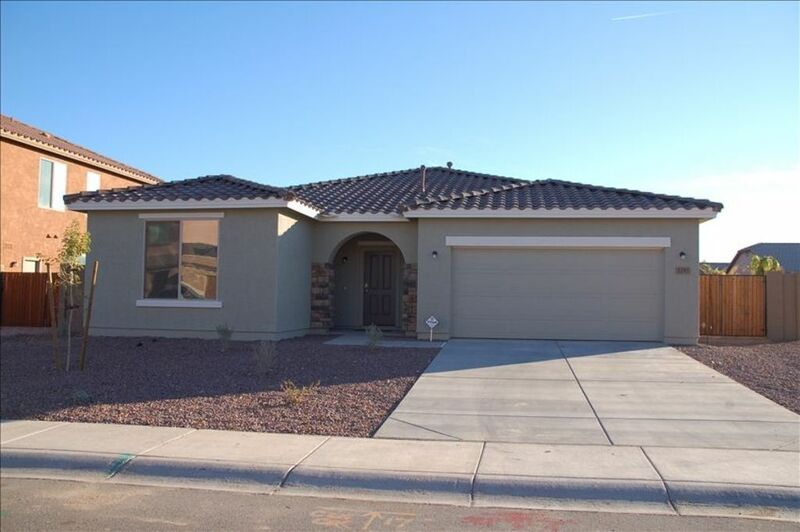 We offer a beautiful vacation rental in our 3 Bedroom, 2 Bath home located in beautiful San Tan Heights. Conveniently located 45 minutes from Sky Harbour Airport and 20 minutes from the Mesa Gateway Airport. Our home will comfortably accommodate up to 8 people while offering beautiful yet comfortable furnishings, appliances, linens etc. The over-sized master retreat boasts a king-size bed with a private ensuite complete with double sinks, soaker tub, separate over-sized shower and large walk-in closet as well as a 32' TV. The second bedroom offers a queen size bed with TV and the third bedroom offers a twin trundle bed and twin bunk beds. The kitchen is furnished with top of the line S/S appliances including a gas oven and range, microwave oven, dishwasher and large refrigerator with ice-maker and water dispenser complete with a water filtration system. Fully stocked with dishes, glasses, cutlery, toaster, coffee maker, hand mixer, rice maker, pots & pans, dish soap, garbage bags, etc. The bathrooms are stocked with hand soap, towels, toilet paper and hairdryers. For your entertainment pleasure the Great-room has an oversized sectional to relax on while watching the 51'Plasma TV or watch your favourite movie on the DVD player or enjoy a wide array of TV episodes and Movies with Netflix. Keep in touch with everyone via complimentary Wi-Fi access. For your music entertainment we have a Multi-room home entertainment system with built-in speakers, independent volume control and iPod connection capabilities. You and your family can enjoy watching a movie in the family room while others are enjoying relaxing music in the master suite or back yard oasis. The backyard is a relaxing oasis. Enjoy a private in-ground pool with Spa, Built-in Natural Gas BBQ, fully covered patio or for the sun-worshippers - extensive uncovered patio area complete with Chaise Loungers and an umbrella! There’s even a wood burning fire pit for your enjoyment! Heated Pool & Spa available year-round *fee. Double Garage with remote access; Monitored security system. The community offers spectacular golfing at a number of 18-hole golf courses, as well as easy access to any of the 200+ golf courses located throughout the Metro Phoenix area. As well as numerous hiking and biking trails, and children's playgrounds. We are conveniently located close to many stunning and challenging golf courses for golfers of all levels, shopping, restaurants, grocery & drug stores. Other attractions in the Phoenix area include NASCAR, NFL Football (Cardinals), NHL Hockey (Coyotes), Major League Baseball (Diamondbacks) and Several MLB Spring Training Facilities. We purchased our home with the intention of eventually using it as a retirement home. However we're not quite there yet so while we are still working, we decided to share it with others by offering it as a vacation rental. You will find a large, comfortable house for your stay. The kitchen is well equipped. You will not need to wish there was something there, as it will likely be there. Beds were comfortable. We had to get in touch with the owners who responded quickly to our questions. This house is a little out of town and seems to be 30-45 minutes away from everything. Not a bad thing if you wanted to spend time in the south/east of Phoenix. There are plenty of amenities nearby however. Love this Arizona Oasis Getaway! Thanksgiving Family Reunion! This is our 2nd year staying at this location. Love that is so close to my family. (Literally 300 yards from my brother's house!) This house has everything you need. Everything is well stocked and nicely maintained. Highly recommend. Beautiful home in a really nice area within walking distance to stores, restaurants and local parks. This home has a well stocked kitchen and lots of towels for inside and out. The bottle of wine and hand written card were a very nice welcoming touch. The written instructions for the home made everything easy to operate. Would highly recommend this home for your vacation stay. We will stay here again. Very spacious, quiet neighborhood, beautiful pool and hot tub. We enjoyed staying at the Arizona Oasis Getaway. Close to Walmart and Starbucks. A perfect place to relax! Just returned from a 5 night stay at this property. It really exceeded our expectations on every level. Very clean, comfortable & modern. The pool & spa were amazing. Aside from a little hangup with the pool/spa remote when we first arrived (remedied very quickly by the owner), we had no problems whatsoever. Good location, close to Gateway airport & easy commute wherever we went. I would recommend this to anyone looking for a great place to stay. My group included myself & 4 friends, however it would be a perfect place for a family with children too. I hope to get back to the area next winter & would definitely stay here again! Thank you for your hospitality! Our family just loved staying at this home. Feisal was so polite and attentive. Everything was laid out perfectly from his excellent welcome package to the pool/spa operation. His home is so inviting and warm. We had zero issues on our 9 night stay. Our kids just loved the pool and spa, and of course the awesome bunk beds in the kid room!! What a fantastic place. We can't wait to stay again!! Optional damage protection insurance instead of damage deposit ($79 cover $3000 in insurance). Rates subject to change until booking confirmed.